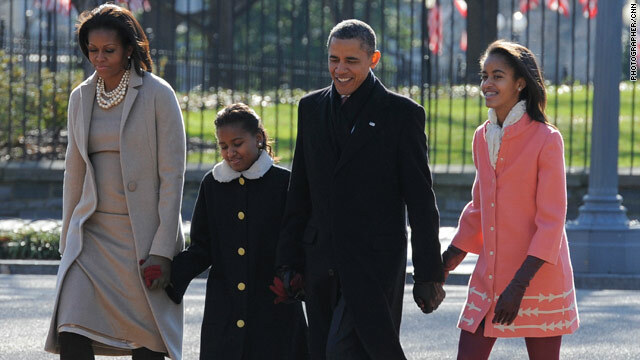 The first family is a "Modern Family"
President Obama revealed in an interview with People Magazine that the ABC comedy hit Modern Family is also a hit with the Obama family. "For the girls and me, Modern Family, that's our favorite show," the President says, adding that he's "a little darker" in his TV habits, listing Boardwalk Empire and Homeland as his must-sees, other than sports. The president and his family are roll models for lots of people. I like the way he limits TV time and him and his wife work togeather to give the girls chores and keep them out of the spotlight. He came from a very modest background and seems grounded. They are a great example of good family values. Jerry, leave Obama, alone. You have a chance to make your own life for yourself and family. It sounds like you dislike anything about him and his family. No matter what you think about this dude and his family some people can sincerely relate to him. Drama Queen. If the republican party told you to take a dog turd, put a string through it and hang it around you neck. You probably would. But hey its all about the dram Dahling! The only one blowing smoke you know where is.....jerry. Jerry, it's a story about a family. No need to ruffle your prejudice feathers. Save it for real bigotry! OMG! if people knew you for who you really are,they are about 99.99% right about you being a racest. Look what you did to your daughter when she invited black friends over. Where were you when the last president was blowing smoke your behind? The first family is a traditional nuclear family. One man married to one woman, neither of whom has been married previously, providing a stable upbringing for their two children who were both born in wedlock. How boring. What a sweet story. I'm sure many like myself are so interested. President Obama doesn't wear his faith on his sleve he lives it and sets the example of family values. It is not those hide behind Christianity and say Lord, Lord, but those who keep the commandments of my Farther who is in Heaven. Obama has good taste in TV. lol. The President and his family are a adorable family. The U. S. should be proud of his family, I can't see why anyone would critize his family. Especially the Repubicans, they are supposely to have such family values, or is that just a myths? Be Proud of your President and his family. Life is too short to always have something negative to say. Be positive sometimes, it good for YOU!!! He does have a nice family but unfortunately that won't put people back to work or get the country's finances in order. Neither will the man with the mistresses or the ones that flips and flops and endorses child labor. No family Bob? Ah, you poor thing. Jealous of an intact family? Ah, you poor thing. Your trailer park get hit by a tornado? Ah, guess you deserved it. Your skin is wasteful. You have no color. You are tanning everyday to become this color. Tour skin is wasting away. So blow away will you. Bob your heart is jaded. Your mind is small and you are a racist. Other than that you are fine human being. I bet Bob.thinks Newtie is a perfect example of family values...! Where was Sobby Bobby when Bush and Cheney sunk the ship of state? Explain why you feel that way. I'd really like to know. If I found myself in your skin, I would be miserable too! What is it like to walk into a room and realize immediately, you are the biggest idiot in the joint? Yeah, Obama is like Modern Family...a bunch of mixed up nuts. Modern Family is a darn funny show, but I'm a little surprised the President even admits to watching TV. Maybe he's trying to soften his Ivy league elitist image. KEEP UP THE GOOD WORK SIR UR DOING A GREAT JOB YOU HAD TO INDEER A LOT IN FOUR YEARS YOU NEVER GIVE UP MR.PRESDENT YOU AND UR FAMILY STAY STRONG DON'T WORRIE ABOUT IGNORNANCE I LIVE IN POPLAR BLUFF MO.WHAT I DON'T UNDERSTAND THE PEOPLE IN THIS TOWN ARE DO NOT NOT LIKE GAYS BLACK PEOPLE ETC.AND THEY ARE POOR PEOPLE HERE THAT ARE ALL GOP MAN HOW COULD BE ANY WAY SIR YOU HAVE OUR VOTES YES LET'S GET IT DONE 2012 OBAMA OBAMA OBAMA YOU HAVE MY VOTE.THANK YOU MR PRESIDENT.